Howdy Partners! 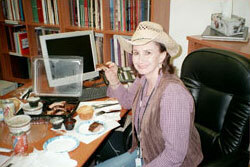 Well everyone here at the store sure got a treat during our Free Lunch Friday – Rodeo style. You see, normally, we each select what we want for lunch off the menu of whichever restaurant is chosen. (And that can be anywhere from Del Taco to Olive Garden!) This time, however, it was a little different. First off, we decided on Claim Jumpers as the most fitting restaurant for our Rodeo Dress-up Day lunch. And instead of getting individual entrees like every other time, Rusty and Marie ordered a whopping three racks of baby back pork ribs for all of us to share. Mmmm! Don’t ‘cha just want to sink your teeth into them! Along side of those racks, we also ordered salad, shoestring French (or more appropriately “Freedom”) fries, onion rings, and monster cornbread muffins. To say the least, we were bustin’ at the seams with all this cowboy-hearty food we were eating. By the end it was time to loosen up those silver belt buckle notches. We of course, had plenty of napkins on hand for those of us that are novices when it comes to the "proper" way to eat ribs, (…which means me…) and boy did I try hard not to wear my food. As usual, the traditional eating pictures were taken, and we “chowed down.” All in all, we had a wonderful lunch provided by the bosses. Little did we know, however, they had a little something sweet in store for us later on in the evening... Wouldn’t you know it? Claim Jumpers Chocolate Cake better known as "The Motherload Cake." Oh boy -- as the resident choco-holic of the store, I was in hog-heaven (or is it bull-heaven?). They had our slices of chocolate delight all neatly packaged for us to take home. And of course, my poor boyfriend was jealous when I got home, I just had to be nice and share a little! ...Thanks Cowgirl Maya! You know, I have to say that out of all the Rodeo related events that take place at the Livestock Arena during the Rodeo (including the Extreme Bull Riding Competition, the opening cattle drive, the parade, the carnival, and the roping events) my favorite event was the special children’s rodeo portion when all the ten year olds and up rode on the backs of sheep and tried to wrestle them to the ground. How cute! 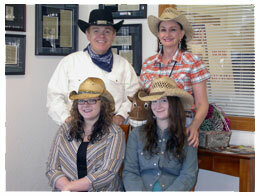 All in all our Rodeo adventures were a blast this year – and we didn’t even have to take a step outside of our store! So here’s sending some of our Wild West memories via Reno, Nevada to all the fine folks out there in internet-land. Next year we expect to see you visit us in spurs.